Welcome to The Sailmakers Bench. 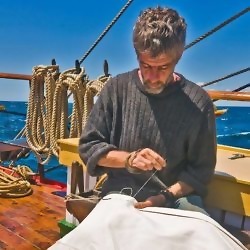 Sewing seams, making grommets, stitching on bolt ropes, splicing rope and wire, all by hand, using the opportunity when ashore to lay out new sails on the nearest dock, beach or hillside and then carrying the cloths back on board to be hand sewn and finished while underway to the next port of call. Hundreds of tons of ship propelled by cotton thread alone, this is how we learned. With the resurgence in tall ship sailing there is also a resurgence of interest in the traditional skills of the sailor and indeed the sailmaker, this combined with a need to use sustainable natural materials makes this form of sailmaking and canvas working the way of the future and not confined to history. We specialize in hand sewn sails from natural materials, but whatever your canvas or rope-work needs may be give us a call. Hand sewn sails from natural fabric & rope, canvas products and fancy rope-work.